Annemieke is the team leader of the Materials Research and Chemical Analysis Laboratory and senior researcher of analytical chemistry. She works on projects in which analytical chemistry plays a large role. 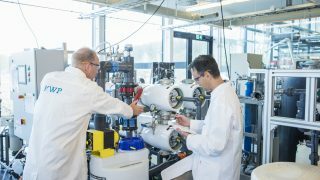 In many of the projects Annemieke works on, the technology of liquid chromatography is used in relation to high-resolution mass spectrometry. She developed a tool (N-labelling) to detect disinfection by-products, researched techniques to analyse very polar substances in water (HILIC), and worked on the combination of analytical chemistry and bioassays: effect-directed analysis of EDA. Annemieke also works on projects in which the identity of unknown micropollutants is clarified, such as in 2015 when the identity of an unknown compound in the Meuse was clarified as pyrazole.